Norfolk Primary celebrates first good watchdog report since becoming an academy. Primary School praised across the board in its first inspection since becoming an academy. 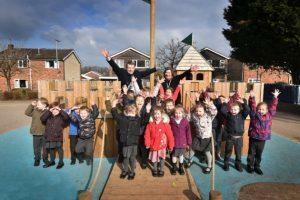 Eaton Primary School was told it was good – Ofsted’s second highest rating – after a visit in January. It comes two years after the school joined the Evolution Academy Trust in 2015 and three years after its previous Ofsted visit, in which it was also judged good – at the time a significant leap from inadequate. Inspectors praised headteacher Allan Lowe’s “supportive leadership”, which they said had contributed significantly towards raising standards. “He is ambitious for pupils and has successfully created a culture of raising pupils’ achievement that is shared by all staff,” they said. There was praise for the “effective” care for children with complex needs, broad curriculum and quality of teaching. Mr Lowe said since converting to an academy, the school had focused on “building an outstanding team of professionals”. “The key for me as headteacher has been investment in people,” he said. “We are constantly looking at ways to develop staff to reach their potential. He said they also focused on inspiring children with an exciting curriculum, which includes trips every half-term and events related to learning subjects. He said, going forward, they would continue to improve writing across the school and support subject leaders. Tony Hull, Chief Executive of the Evolution Academy Trust, said the school had moved from a borderline good to the upper end of the band. “There has been a lot of hard work by everyone involved with the school over the last two years and it shows in this report,” he said.